Back in 1972, Winston came onto the scene and gained recognition for his makeup work on a tv series called ‘Gargoyles‘, which studios took notice of. He then met and became a life long friend of Michael Jackson on the set of ‘The Wiz‘, which he also did the makeup for. Even in 1982, he received an Oscar nomination for his work on ‘Heatbeeps‘, but it wasn’t until after then, that Winston became the household name he is today. Mr. Stan Winston then met James Cameron and the rest is history. Winston is responsible for creating the looks of ‘The Terminator‘, ‘Aliens‘, ‘Predator‘, ‘Edward Scissorhands‘, ‘Monster Squad‘, and ‘Batman Returns‘ to name a few. He is solely responsible for the creatures that have haunted our dreams for ages. But Mr. Winston only wanted to direct a movie at some point, which in 1988, he received the chance to adapt a story from mysterious writer and poet Ed Justin, called ‘Pumpkinhead‘. In 1988, the slasher movie craze was in high gear still, and Winston more or less made a slasher movie, but instead of the traditional supernatural killer offing teens one by one, he replaced that aspect with a giant terrifying monster with a background and taste for revenge. Winston only directed two feature films and two short films including this one and a 44-minute long music video with Michael Jackson called ‘Ghosts‘. Winston for sure knows how to use his camera, but the script and lack of character development in ‘Pumpkinhead‘ disables us from really connecting to the film as a whole, and leaves us just wanting more of the monster. Back in 1957, a young boy named Ed is scared out of his wits when a neighbor comes to his parent’s doorstep in the middle of the rural country to ask for a hiding place. His parents refuse to let him in and tell him he dug his own grave and to accept the consequences. Little Ed hears this man scream in terror that he was only a little guilty of child murder, and then witnesses a giant demonic creature brutally killing this man. Then we cut to a few decades later where little Ed is now adult Ed (Lance Henriksen), who has a cute young boy of his own named Billy (Matthew Hurley). Winston shows us that this father and son relationship is very kind, gentle, and full of fun and love, but it is never shown why the two are without a mother/wife or why the two are still out in the woods, considering what Ed saw when he was little. One day while Billy and Ed are working at their local market store in the middle of nowhere, a group of teenagers from the big city come rolling in for a little vacation. When Ed leaves Billy to man the store for a few minutes, Billy is involved in a tragic accident with the teenagers and their motorbikes. When Ed returns and sees that his boy is dead, he is completely broken and lost. Instead of moving on and angered by the teenagers, Ed looks for help in the backwoods who might have the answer he is looking for. That’s when he comes across Haggis, an ancient old witch who looks like an old deadite from ‘The Evil Dead‘ series. With some of his dead son’s blood and a little bit of his own, and with a newly dug up corpse from the graveyard, Haggis conjures up ‘Pumpkinhead‘, a giant demonic creature that looks a bit like the ‘Alien’ creature. Unfortunately for the teenagers who are still vacationing nearby, Pumpkinhead takes them out one by one. 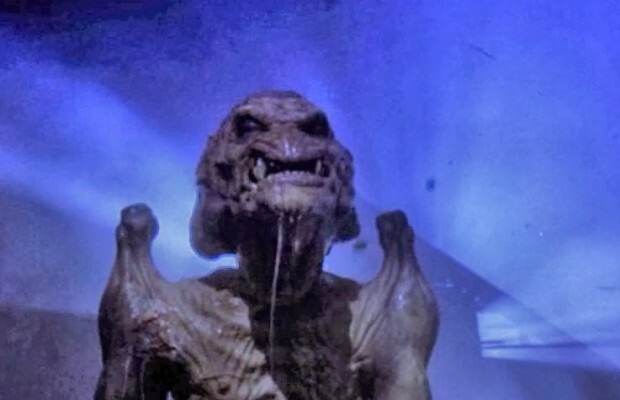 Although it doesn’t quite explain it to us, the folklore of Pumpkinhead has this creature killing and exacting revenge on the people who did a bad thing or at least witnessed it happen. But I guess the real undertone and moral of the story is that revenge is the real monster that will eventually not only take out the bad guys, but yourself too. And that’s the case with Ed who begins to figure out that he and the creature are linked in more ways than one. If there was a bit more time exploring the mythology of Pumpkinhead, or even showing us a decent backstory to Ed himself, then maybe the film would have played out better than it did, but instead it has the usual genre elements to garner scares with a bit of gore. That being said, ‘Pumpkinhead‘ is still fun to watch and has held a cult status since it’s debut over 26-years ago. There is a reason why there are sequels and a remake in the works, and that is because ‘Pumpkinhead‘ is highly entertaining still today and a bit scary. ‘Pumpkinhead’ comes with a great 1080p HD transfer and is presented in 1.85:1 aspect ratio, courtesy of Scream Factory, which is an off-shoot of Shout! Factory. ‘Pumpkinhead’ is 26-years old and image wise, this new transfer looks very good. 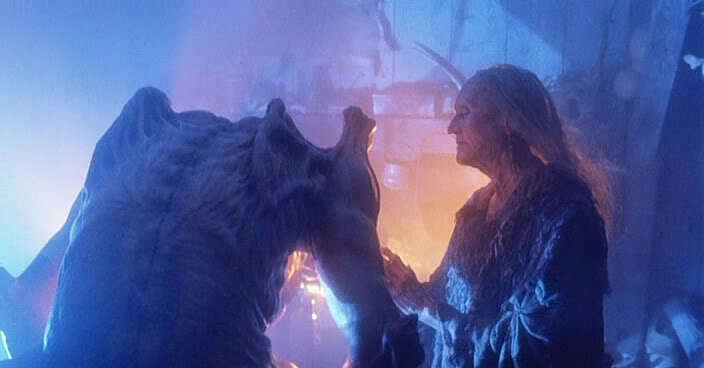 Stan Winston used his camera to show quick shots of the monster and whenever you did in fact see Pumpkinhead, he was in very low light with either a nice blue hue or a hot orange glow. It was to add to the mystery and terror effect of not seeing the monster up close, and it worked to great effect. That being said, some of those quick scenes and some of the darker lit scenes look a bit softer than normal without a whole lot of fine detail to make out the minute characteristics of the creature. Other than those short scenes, the image has great detail, which is vivid and sharp. You’ll be able to make out individual hairs on the actor’s heads and faces, see dirt specks and wrinkles up close, and even some fine stitching in their 80’s costumes. The colors looks well saturated as well, with again, the blues and oranges standing out the best. There is also a nice layer of grain, giving the film an organic and filmic look, and not like it’s been put through the digital car wash. Black levels are deep and inky for the most part and skin tones are natural. There are a few instances of a few specks on the print, but it’s nothing to write home about, leaving this classic 80’s horror film, the best it has ever looked. No other compression issues were noticed here. Thankfully this release comes with two different audio mixes. One mix is for those who want to watch the film as it originally came out in DTS-HD 2.0 Stereo, and then there is the more modern DTS-HD 5.1 audio mix. Both sound quite good, but in my opinion, if you truly want to immerse yourself in the woods with the giant scary creature, go with the 5.1 option. Both have crystal clear dialogue that is easy to follow without any issues of cracking, popping, or hissing to speak of. Both mixes are front heavy, but on the 5.1 mix, the sound effects and ambient noises are transferred to the rear speakers and are often quite loud and robust, giving you a better sense of the film. There is great directionality in both tracks as well. Whether it be a motorbike zooming past, thunder rolling, or people screaming in the distance, the audio sounds very layered, organic, and great. The LFE is very good with a wide dynamic range. The score always adds to the suspense of the film without drowning out any dialogue or sound effect. I don’t think this audio mix will move mountains, but it has some spectacular moments. Audio Commentary – Writer Gary Gerani and FX creators Tom Woodruff JR. and Alec Gilis are moderated by superfan and film guru Scott Spiegel as they discuss the making of ‘Pumpkinhead’. The give us some techinal information on how they shot the film and did the visual effects, as well as some funny stories that happened on set. They even go discuss the mysterious Ed Justin. A great listen. ‘Pumpkinhead’: Unearthed (HD, 64 mins.) – Here is an in depth look that runs over an hour long that discusses the aspects of making the film. It is broken up into chapters that deal with the origins of the story, the casting, the visual effects, and the success of the film. There are plenty of interviews with the cast and crew as well as some on-set footage. Excellent bonus feature here. Night of the Demon with Richard Weinman (HD, 17 mins.) 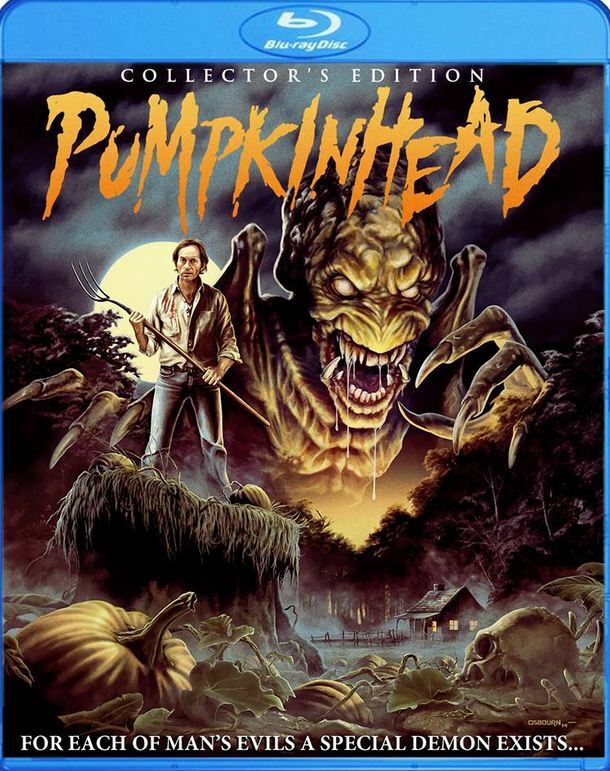 – Here is a great interview with one of the movie’s writers where he discusses the background information on Pumkinhead and the author Ed Justin, who came up with Pumpkinhead in his own poem. Behind The Scenes (HD, 8 mins.) – Here is some old archival footage from the actual making of the film that show creature tests and the actors performing in front of the camera. Quite cool to see how the filmed this. The Boy With The Glasses with Matthew Hurley (HD, 15 mins.) – Here is an interview with the little boy in the film, but he is all grown up now and he discusses in great length about what it was like to work on a movie like this. Great interview. The Redemption of Joel with John D’Aquino (HD, 14 mins.) – Here is another great interview with actor John D’Aquino who played Joel in the film. He discusses his character, his time on set, and even the marketing of the movie. Remembering the Monster Kid: A Tribute to Stan Winston (HD, 50 mins.) – This is an EXCELLENT bonus feature that pays tribute to the late Stan Winston, who was not only a director, but one of the best makeup artists and visual effects artists ever to come out of Hollywood. This has interviews with people he knew and worked with along with images and footage of the man himself working on his famous creatures. Demonic Toys (HD, 5 mins.) – Here is a small look at some of the Pumpkinhead toys you can purchase today. Still Gallery (HD, 14 mins.) – Images of the film, promo posters, and behind the scenes in slideshow format. Theatrical Trailer (HD, 2 mins.) – Original theatrical trailer. ‘Pumpkinhead’ still holds up 26 years after its debut. Despite some of its flaws, this horror film is still one to own and have in your collection. The monster itself is iconic, scary, and still looks cool. The video and audio presentations won’t win any awards, but they both look and sound great. And the real treat is with the bonus features. There is a treasure trove of extras here that are all worth watching. My suggestion is that you add this release to your collection in time for Halloween. This entry was posted on Monday, September 8th, 2014 at 4:40 pm	and is filed under Film, News. You can follow any responses to this entry through the RSS 2.0 feed. You can skip to the end and leave a response. Pinging is currently not allowed. « ‘Dexter’s’ Michael C. Hall Glams Up for Broadway’s Hedwig!! !